Barilla® Italian-Style Entrées deliver the taste and quality people have come to expect from Barilla – Italy’s #1 brand of pasta – in a single serve offering. 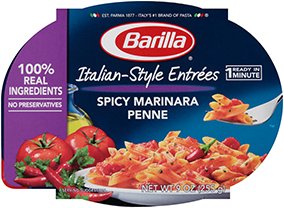 Made from the same high quality ingredients as Barilla pasta and sauces, our Italian-Style Entrées are shelf stable, portable, and ready in just 1 minute! Find them in the microwaveable meal section of your local store. Made with non-GMO ingredients. For more information, please read our position. We believe all our products should be good for you and the planet.